Is your child ready for a sleepover - or, to put it another way, are you ready for your child’s friends to take over your house, with the chances of any sleep actually occurring being highly unlikely? For confident children, six is an ideal age to start experimenting with a sleepover (also known as a slumber party). It’s a great opportunity to strengthen the social bonds your child has formed on the playground, and to show they can act responsibly by playing host in a safe environment (i.e. under your watchful eye). Children who are still clingy at bedtime, who haven’t slept over at a family member’s house, or who turn into monsters due to lack of sleep may not be ready to run the gauntlet of a sleepover – therefore it’s essential to speak to parents first before extending any invites to kids. If the answer is ‘No’, don’t take it personally; just leave the invitation open-ended for when the child is a little older. You’ll need to decide: is the sleepover going to be a one-on-one event, or can your child cope with a bigger group – providing enough entertainment to sustain a whole evening? A good approach is to start with one guest; then build the quota up gradually. You may eventually have up to eight or 10 houseguests for special occasions such as birthdays, but that takes a brave parent indeed! When drawing up your invite list, try to come up with an even number of guests so no-one gets left out in group games – and give plenty of notice. Boasting social diaries most A-list celebrities would be proud of, most children are ‘booked up’ with parties and playdates weeks in advance, so extend your invites in plenty of time. Saturdays are the best option, when daytime activities should have tired everyone out sufficiently so that sleep is at least a slim possibility – or, if you value your weekend time (and let’s face it, who doesn’t? ), Friday-night sleepovers give everyone Saturday and Sunday to recover. Be clear about the start and finish time. If you’re planning a 5pm start, you’ll need to offer teatime food (takeaway pizza goes down a treat). Make life easier for everyone with a 7pm start; your guests can arrive in their pyjamas and crack straight on with the snacking! Specify a pick-up time for the morning – late enough so everyone can enjoy a leisurely breakfast, but before noon so you still have the rest of your day. Decide where everyone is going to sleep. Is your child’s bedroom big enough, or will they need to ‘camp’ in the living room? Encourage children to bring their own sleeping bag. A Dinky Duvalay (based on Duvalay’s award-winning luxury memory foam sleeping bag for grown-ups) is ideal for two to eight-year-olds. 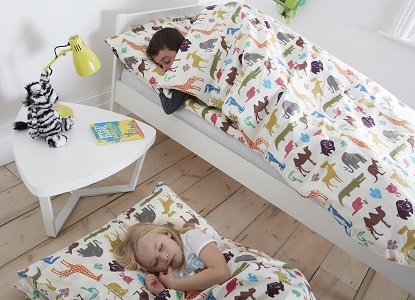 Invest in one at an early age to use as an extra layer of cosy comfort on their bed at home. When they’re a little older, simply roll it up and take it to sleepovers for a sense of comforting familiarity in another household. Combining a bottom pocket with removable memory foam – and a top pocket housing a duvet – the Dinky Duvalay comes in a magical animal print that children of all ages will just love! Round up any adult troops you’ll need to hide in the kitchen with. If possible, send very young siblings off to the grandparents for a sleepover of their own (one less thing to think about). Shop for shareable snacks – anything that young children like to hoover up in large quantities, such as pizza and popcorn – and breakfast provisions. This is one occasion not to push the ‘healthy food agenda’, but make sure you check with every parent for any individual allergies and details of how to administer any special medication their child is required to take. Keep a list of each parents’ contact details to hand, as well as a first aid kit for bumps and scrapes. Make sure your hall, stairs and landing are well lit so children can easily find their way to the bathroom – and highlight any danger spots you want kids to be especially mindful of, such as steep staircases and hot taps. Show them where you will be sleeping so any fretful kids know where to find you to seek comfort, and rebels can report any catastrophes. Don’t worry too much how your child and their guests will entertain themselves; children are always much more inventive and resourceful than you can imagine. However, fun activities you can encourage include beauty makeovers, karaoke and watching films. Try to pace the fun so your child’s guests don’t burn out after the first 60 minutes, and call in every now and again to see how things are panning out. At least go through the motions of giving a ‘lights out’ time. (Some children will even secretly thank you for it, even if it’s largely ignored.) Be prepared for early risers by putting out snacks they can help themselves to, such as breakfast bars or muffins. Putting the TV on quietly, or providing a stack of comics will keep them occupied until later risers emerge from their pits. Encourage everyone to help with the morning tidy-up. We’re not talking handing out mops and buckets, but it’s not unreasonable to expect games and DVDs to be put back in their place and stray socks to be retrieved from under the couch. Roll up the Dinky Duvalays and stack them by the front door for a quick and easy exit! Now, it’s time to get your grown-up Duvalay out for a well-earned afternoon of lounging on the couch! Steadying your nerves with lashings of gin is optional.